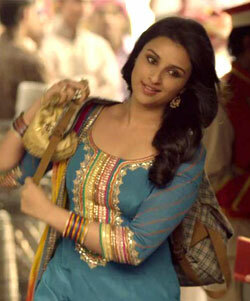 Lyrics of Tere Mere Beech Mein from Shuddh Desi Romance is penned by Jaideep Sahani. This is a lovely song composed by Sachin Jigar and beautifully sung by Sunidhi Chauhan and Mohit Chauhan. Enjoy Tere Mere Beech Mein Lyrics from film Shuddh Desi Romance. Hey sun.. sun le na..
Gaflat mein na rehna tu..
Ki Tere mere beech mein kya hai..
Ye tere mere beech mein kya hai..
Kabhi jo raaz ho koi..
Kahin jo raat ho koi..
Ho tere mere beech mein kabhi jo baat ho koi..
Jeet mein chhipi chhipi kahin pe maat ho koi..
Jaanoonga main haule se tera har armaan.. Finally chali hai meri love life..